Kick off Mardi Gras with a sweet bang and make a batch of these King Cake Rice Krispie Treats Recipe. 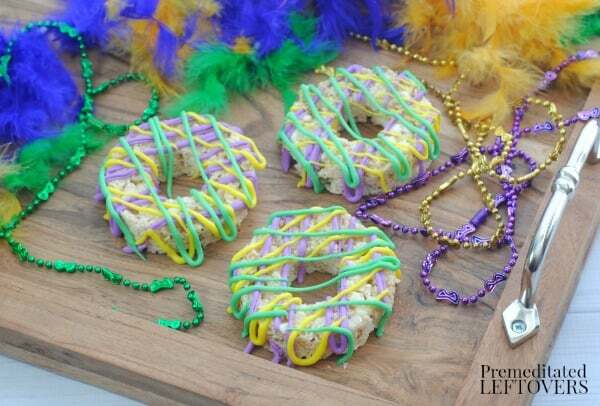 The good times will be rolling at your Mardi Gras celebration when this buttery sweet and festive King Cake Rice Krispie Treats Recipe is brought out! 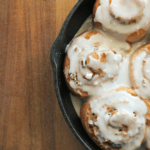 It makes a fun addition to your dessert table and gives the traditional king cake a little shout out without all the work. 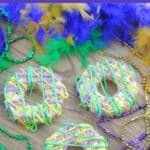 I love the vibrant colors of a Mardi Gras King Cake, but it takes time to make one. 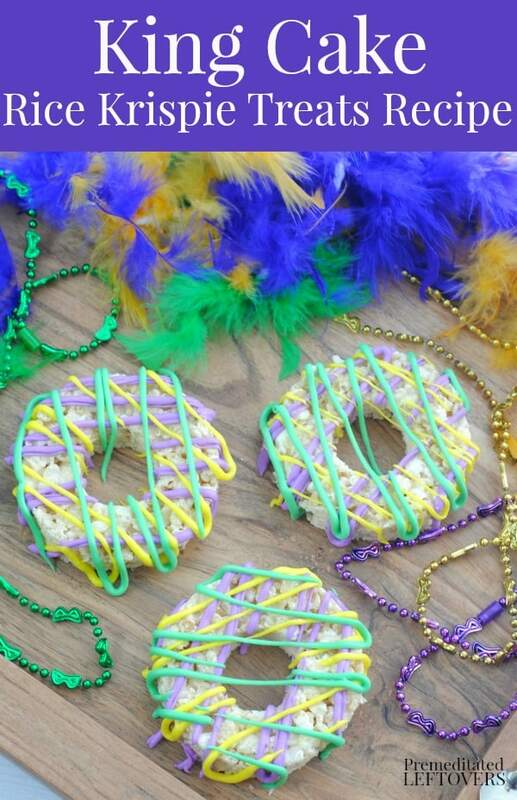 This is an easy no-bake Mardi Gras dessert idea that kids are sure to love. You could also substitute buttercream frosting and use food coloring for the frosting colors. Heat the 3 tablespoons of butter and mini marshmallows in a large saucepan. 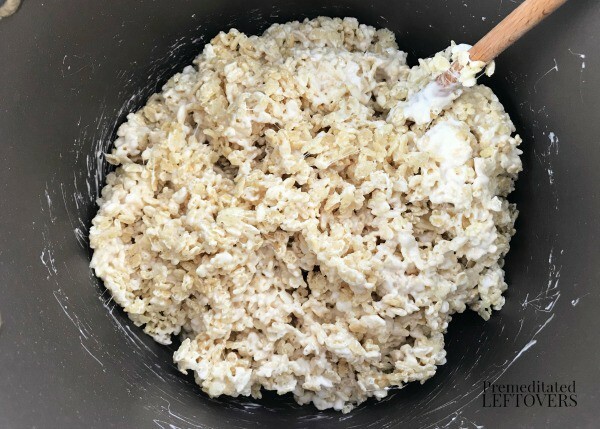 Once the marshmallows have melted most of the way, pour in the Rice Krispies and gently fold into the melted marshmallows. Pour the mixture into the prepared 9×13 baking dish and evenly press down. 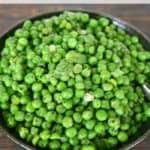 Place the 9×13 baking dish in the fridge for 30 minutes to allow the treats to firm up. 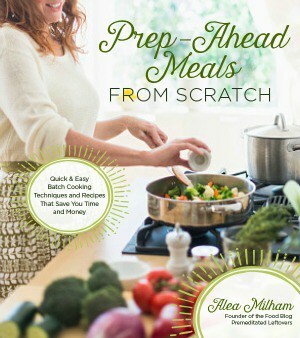 Remove the dish from the fridge and lift the foil from the pan. 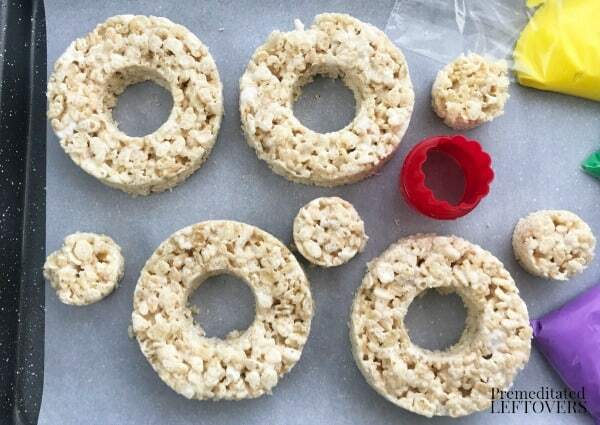 Use the large cookie cutter to cut out 8 Rice Krispie Treats as close together as you can, setting aside on the prepared baking sheet. Use the small cookie cutter to cut out the middle of the treats. If you using white frosting and food coloring: separate the frosting into 3 separate bowls. Give each bowl a drop of food coloring (purple, green and yellow) and stir in to combine. 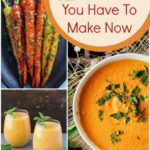 Heat each of the colored frostings in the microwave for 15 seconds. Scoop each colored frosting into a small sandwich baggy. Snip one corner using a pair of scissors. Gently squeeze each color over the top of the Rice Krispie Treat in a back and forth motion. 14. Allow the icing to harden. 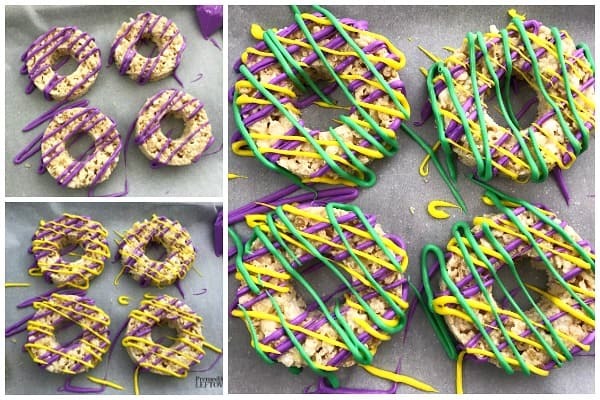 These easy Mardi Gras "cake" shaped Rice Krispie Treats are covered in purple, green, and gold icing. Line a 9x13 baking dish with foil and spray with non-stick cooking spray. Pour the mixture into the prepared 9x13 baking dish and evenly press down. Place the 9x13 baking dish in the fridge for 30 minutes to allow the treats to firm up. 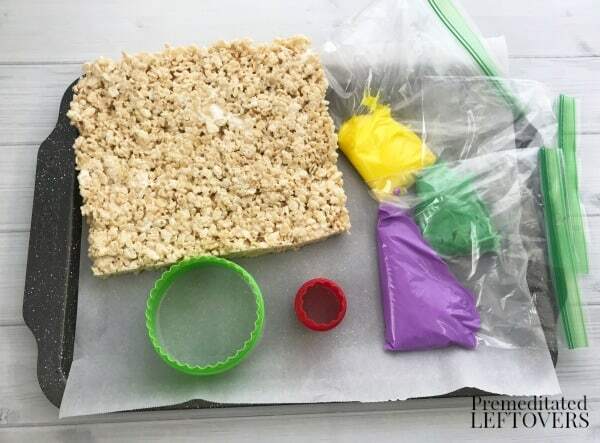 Gently squeeze each color over the top of the Rice Krispie Treat in a back and forth motion. Allow the icing to harden.